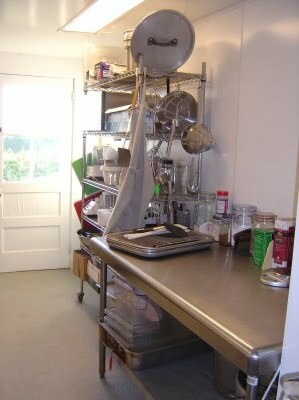 The dish station is slowly filling with equipment, racks, and shelves. The dish station, hence its name, is the center of ware-washing, but it will also be used for food preparation, for which we had to put in a separate sink. 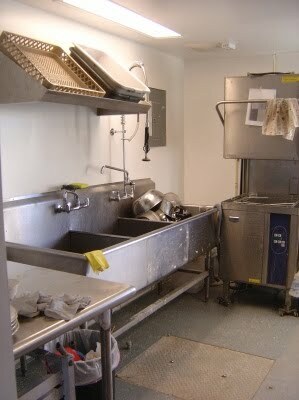 The health department loves sinks, the more the better. Let's see: You need a two-bay or three-bay sink for ware-washing (depending on whether you have a sanitizing dish washing machine or not), a mop sink (spills and subsequent mopping happen), a hand sink (for washing your hands; it is normally motion activated, because your hands may have touched raw meat or other greasy stuff, which you don't want to leave all over a faucet handle), a prep sink (for washing vegetables, or any other kind of food, which for obvious reasons you don't want to do in the mop sink), and ... oh, I think this is it.